Throughout history many women and men accomplished great things. 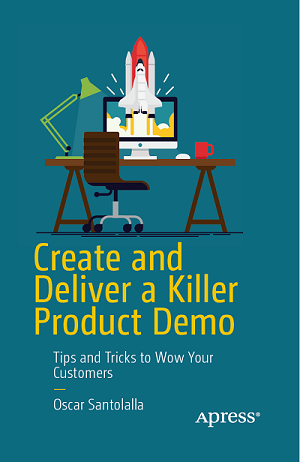 Ideas were crystallized as actions and became artworks, books, inventions, songs, and speeches. Nothing would have happened without sticking with discipline and determination to routines. 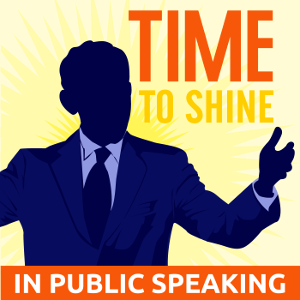 Since the very first episode of Time to Shine Podcast back in October 2014, all our guests have answered the question “Could you share with us a Routine to Shine?” All the answers have brought extremely valuable techniques that can be repeated daily or very regularly to master a specific skill set and become a great speaker. Garry Parker says that-as many Opera singers do-eating ice cream nicely chills, cools and opens up the vocal chords. Do it shortly before you go to speak, and you will be ready for action with a clear voice and with a positive feeling. Florian Mueck is a great fan of Jim Carrey, the actor who once said in a TV interview “My best friend is the mirror.” Try your smiles, your sad faces, how you appear anytime you’re in front of the mirror. Just be careful, don’t make funny faces when strangers come into the elevator. Mueck says that we spend 20 minutes per day in front of the mirror. Laura Penn says that you can do this daily. Turn on a reality TV show, and turn the volume off. Sit down and watch it for 10 minutes, and study the gestures, micro-movements, expressions to learn the skills for yourself. Be a student of body language. Alicia Dattner practices yoga laughter every day. First do a power pose, standing your legs slightly apart, arms up and wide, chin up, face to the sky. Then let out some laughter, and keep laughing until it feels real. The power pose lowers cortisol and raises testosterone, and the laughter lowers your blood pressure, and lets you breath more deeply. Do it 5 minutes in the morning. Martti Vannas believes that talking to strangers will help you to conquer the fear of facing a stranger. Do it at the elevator, traffic lights, in the queue, etc. Say “Hi” and exchange a few words. Not empty small talk, but you should really have something to say: compliment what she or he is wearing, or show something you’re doing or thinking about. The ultimate goal is that you’re not afraid of talking to anybody in life. Katriina Haikala says that everybody should take as a routine every day: Play. Katriina learned this from the book Homo Ludens (“Playing Man”) by Johan Huizinga. Play with ideas, objects, words, riddles, etc. When you are having more fun, you will shine. People (the audience) wants to listen to people (e.g. a speaker) who is very happy and energetic. Oscar Clark always wears a hat, which has become famous in the game community. He recommends us wearing a hat or something else that creates a visually recognizable outline, been seen everywhere. Do you remember Churchill’s cigar? That prop made him recognizable. In 2015 Sarah McKay delivered a fantastic TEDx talk on how taking a 20-minute afternoon nap is excellent for your brain health. She calls it “indulging your neurobiology.” The 3 main benefits of naps are: they improve your memory, spark creativity and smooth your rough emotional edges. That’s why Sarah strongly believes in it and she recommends you to do it every day. The 2014 World Champion of Public Speaking Dananjaya Hettiarachchi recommends us to speak to kids (school children). 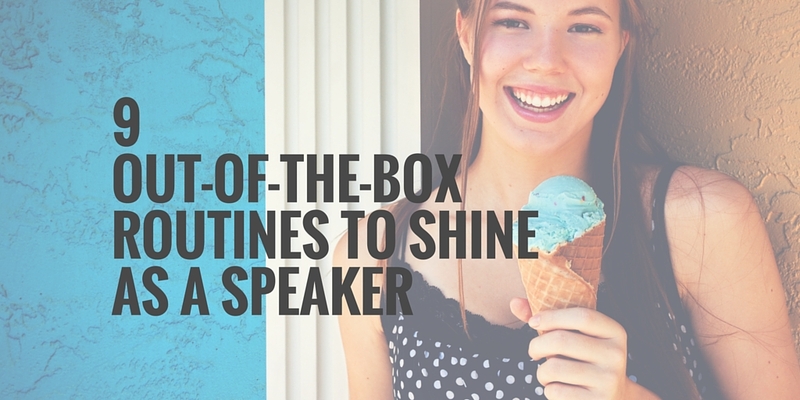 Before a keynote or champion speech, go and rehearse first in front of children. We all have an inner child. Great speakers always talk to the inner child in you, not to the adult. Did you find a new routine for you? Did you like the routines? Most probably more than one of these routines is just for you. Put them in action, enjoy and shine! I’m preparing for a big speech coming up next month in Indonesia and found that 2, 3, 5, and 9 seem like ones that would really help improve my presentation. I’ve done some of these but ones like ‘train your expressions’ and practicing in front of children I have not tried and would love to give it a shot.